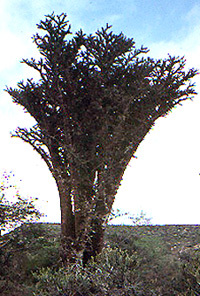 Alluaudia comosa near Tulear. This strange tree has branches that are very thick at the base and then taper almost immediately to fine, spiny branchlets. Tulear's landmark plateau La Table can be seen in the background.